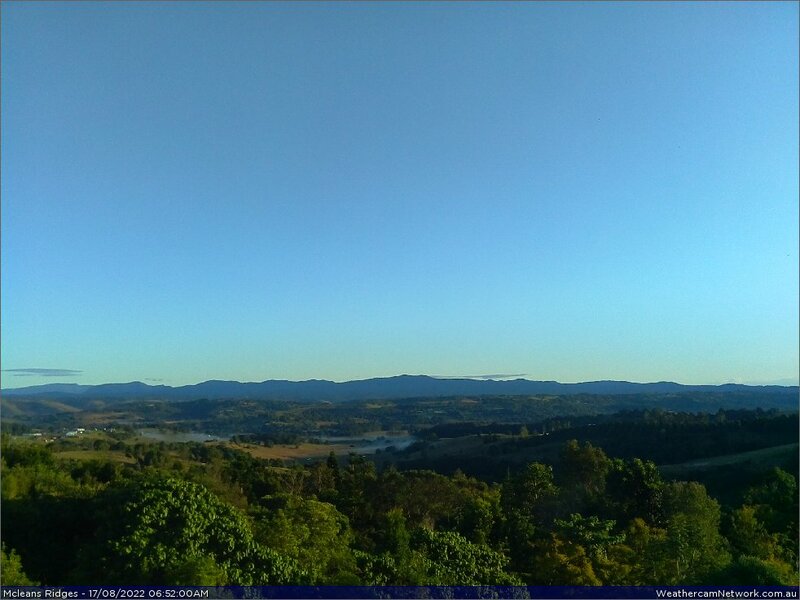 The camera is located at McLeans Ridges, 12km east of Lismore and 9km northwest of Alstonville, in the Northern Rivers district of NSW, Australia. The site is 140 metres above sea level at Lat: 28o 47' 38" S (-28.79), Lon: 153o 23' 54" E (153.40): Google Map location. The Nightcap Range is in the background and the Wilsons River upstream of Lismore is in the valley foreground. The camera is operated by Michael Bath with images typically updated every 30 seconds. For the latest lightning and weather photography and storm chasing, like our Northern NSW Severe Weather Facebook Page. See also observations from the WeatherBug AWS. McLeans Ridges is also an official Bureau of Meteorology (BoM) rainfall location - site ID 058023. Past observations from nearby AWS at Ballina and Lismore are available from the BoM. See also the Spring Grove AWS (about 5km northeast of Casino) which provide online weather observations 24/7. AWS month-to-date totals and averages are available from the Daily Summary Page.